The Glenrothes is one of those distilleries that you know what you are likely to get – strong sherry influence, robust and full. It is what one of our samplers called a “Ronseal” after a well-known UK ad for varnish that came out over 21 years ago… The brand was known for its simple ad line “Does Exactly What it Says on the Tin” which soon became synonymous with anything that is what it says it is. Nice and classic, and so sweet it was almost like sipping rum. In short, it was exactly what you expect from a quality sherry matured whisky. While I preferred the Highland Park solo without a cigar, The Glenrothes was a perfect cigar partner! What do The Glenrothes folks have to say on the box? Distillation is unusually slow and takes place in unusually tall stills which deliver a sweet, clear, fruity spirit. Maturation is in American oak and Spanish oak casks, a combination designed to deliver a perfect balance of flavours associated with our award-winning Speyside single malt; ripe fruits, juicy citrus, creamy vanilla and complex spices. And what would this set you back? These days, it would be about £155.46 online at Master of Malt. We opened our bottle in September 2018. In our latest greatest adult evening, what all did we try? 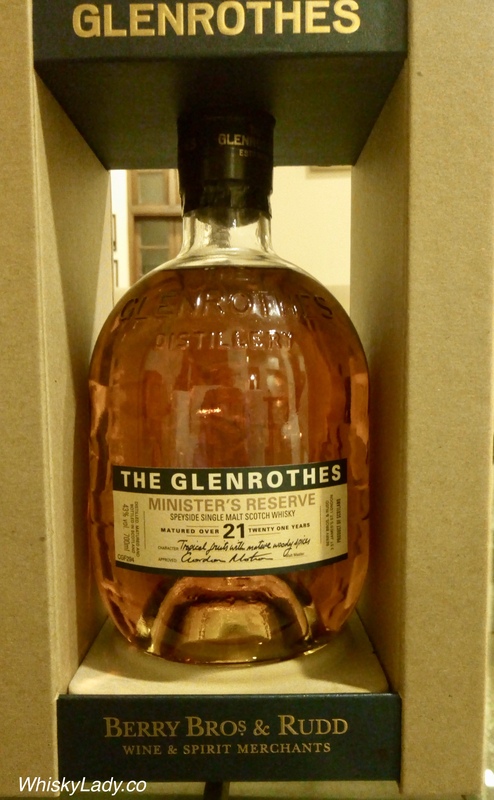 This entry was posted in Scotland, Speyside and tagged Minister's Reserve, The Glenrothes, The Glenrothes 21 year by Carissa Hickling. Bookmark the permalink.